Since graduating from college in 2012, Marco has been building furniture and sculpture by commission. As well as working with wood, he has become increasingly interested in machining metals and constantly strives to learn as much as he can. 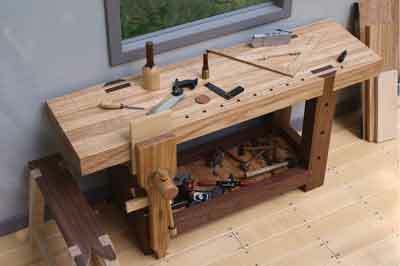 Every moment of his free time is dedicated to making and restoring tools, and learning more about the crafts. Marco says that he has been obsessed with woodworking for as long as he can remember. "I am unsure of where the passion stemmed from, for no one in my family is a woodworker. When I was about eight years old, I started building balsa wood stick airplane kits. I could not stop, something about the precision cutting and fitting just seemed right, but it did not fulfil me completely. After all, it was just a kit with instructions anyone could build. After completing many kits they were no longer fun, nor challenging. I quickly came to the realisation that with tools and materials anything I could dream up could be made, the skill set would develop over time." During the summer breaks from school, he would sometimes help his dad at work, doing construction labour, and being paid in tools. "Dad would take me to the tool store and let me pick something out. I started with a drill press, which led to a scroll saw, disc sander, bench lathe... By the time I was 14 years old, I had a decent little shop of my own set up in the basement. I spent all my free time in the shop, working diligently to build a skill set. I turned endless pens, bats and bowls. I scrolled out countless patterns, anything to keep me in front of a tool." Marco looked to popular American woodworkers for inspiration: "I read all the woodworking books and magazines I could get my hands on. I watched Norm Abram's programme The New Yankee Workshop religiously, as well as Roy Underhill's The Woodwright's Shop. These two gentlemen are my biggest inspiration in the field of woodworking. Seeing their fully tooled shops, producing whatever they could dream up, made my passion burn deeper. It was so nice to see woodworking from a power tool perspective, as well as hand tool perspective. To this day I use an equal amount of hand and power tools." Using these books and TV shows, Marco taught himself the fundamentals of woodworking, learning by doing something the wrong way and learning the right way as a result. He says this only resulted in one hospital visit! His high school did not have a woodworking programme, so at school he was more interested in the visual arts. Near the completion of high school, the College for Creative Studies (CCS) in Detroit sent some representatives to do a presentation on their programmes, which helped Marco decide on his next step. "I was drawn to the crafts programme once I saw the student work, being a mixture of finely crafted items with a sculptural design approach", he says. "It was the perfect marriage of my passions. I was accepted to the college with a decent amount of portfolio-based scholarships." 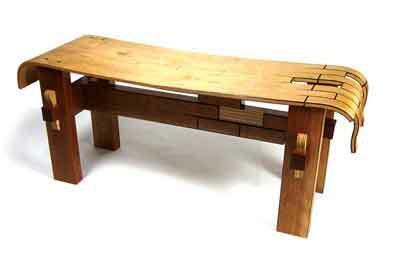 In college he concentrated on Art Furniture within the crafts programme. 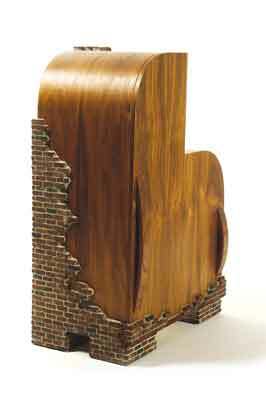 "Art furniture is any conceptual sculpture that retains a function, whether it is a chair or a lamp", he explains. It was at this point that Marco received 'in person' formal instruction in woodworking for the first time. "I learned how to mill lumber from rough sawn stock, the basics of joinery and bent laminations", he says. While at CCS, Marco also became interested in metal work for the first time. "I found myself intrigued by the processes and tools because they were foreign to me. I also realised the implications metalsmithing could have for my future work", he explains. The woodshop at CCS was mainly tooled for power tool work; the hand plane cabinet was completely neglected by most students, but not by Marco. 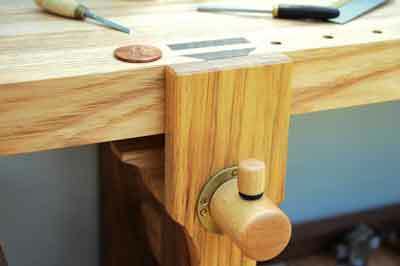 "On my own, I dove deeper into the hand tool work because it allowed me to reach that level of craftsmanship I needed. 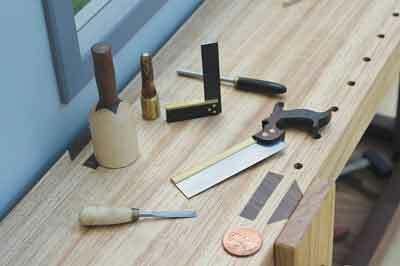 I gradually purchased quality hand tools and spent a lot of time learning their ways. I learned how to dimension rough sawn stock with a hand plane, as well as how to cut joinery by hand - something I often practised if I had any down time." Hand tools still play a part in Marco's work today: "These days, I use the power tools to get me close, and the hand tools come out for the final fit. After all, time is money if you want to make a living in the craft world. If I could afford to, I would do it all by hand for the satisfaction, and peaceful nature of handwork." Throughout his college days, he collected vintage machinery and slowly replaced most of his childhood benchtop tools. He spent a lot of time rebuilding his machines, and tuning them to perfect condition. He describes this process as a kind of 'addiction' and a very satisfying experience: "Bringing someone's 100-year-old filthy tool back to new condition, and creating endless projects with it felt amazing." When asked what he considers to be his essential tools, Marco names two: his 6in Starrett combination square and 6in dial callipers. "I seem to have these in my hands everyday. Most of my work is done in decimals of an inch, not fractions. The callipers give me the tolerances that I cannot expect of my combination square. I would be lost without them." 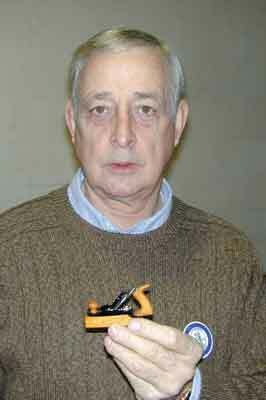 His latest woodworking tool purchase was a 4in miniature tablesaw made by Byrnes Model Machines. 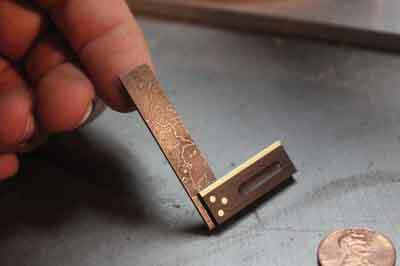 "It allows me to quickly and very accurately cut small stock, with minimal tear-out. The saw is built exceptionally rigid, and is virtually vibration free. Prior to owning this machine, I rough cut small stock on the bandsaw. Using a hand plane and a shooting board I would work it down to final size. 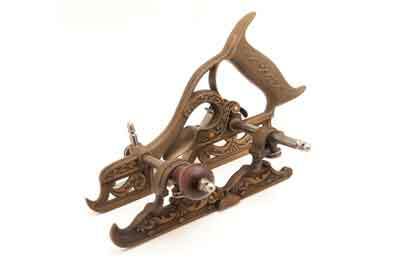 I still use a hand plane for the final finishing pass even after the tablesaw." Aside from woodworking itself, the tools involved and the workshops they live in have always been a fascination for Marco. 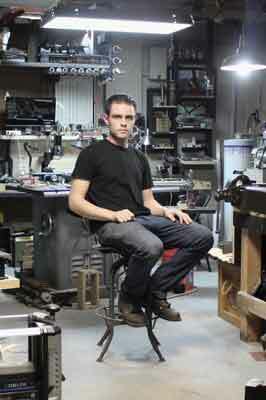 "Any workshop, whether it be Grandpa's garage bench or a master's shop, I love it", he says. "Workshops provide the environment for the mind and hands to work as one to create physical things from nothing. The tools themselves are the means of making this magic happen." 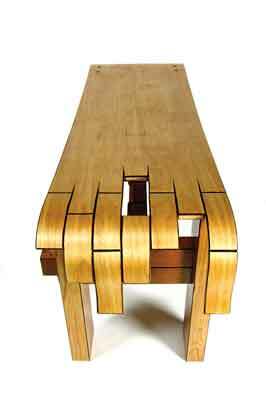 His favourite piece of his own work is the 1:4 scale Roubo workbench, which was the first piece that he machined all the brass hardware on. Also, the leg joinery - through mortise and sliding dovetail - was the most challenging he had ever attempted, especially as it was done in unforgiving hickory (Carya spp.) wood. "Finishing the bench gave me a sense of accomplishment I have never felt before. It also fuelled up my love for small-scale work", he told us. When he sets out to make a piece, form and function are the most important considerations for Marco. "I like to create things that tell a visual story, as well as retain the handcrafted look. My forms are influenced by architecture, nature and the functionality of the piece. The most important aspect of my work is the details. I like some part of every piece I make to have a detail you can look really close at and admire the craftsmanship," he says. Marco says he has a tendency to 'overengineer' his work to ensure it will last a lifetime or more. "The life of a piece is something I always keep in mind when designing. 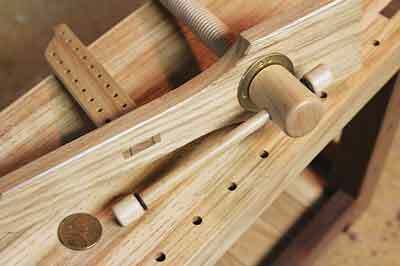 This leads to proven joinery choices and tested material combinations." He prefers to work with local timber for environmental reasons: "I only use domestic materials unless it is for a small detail, because I do not agree with shipping wood across the world when I am surrounded by it." In the future, Marco would like to start a business selling a limited-edition product line including high-quality hand tools, furniture and collectables. "There will be an extreme emphasis on the details. I would like every product to be finely crafted and presented as such in a wood box complete with a numbered brass plaque. The product line will be ever changing over the years," he says. With his eye for detail and love of quality, we're sure he will make a great success of this venture. 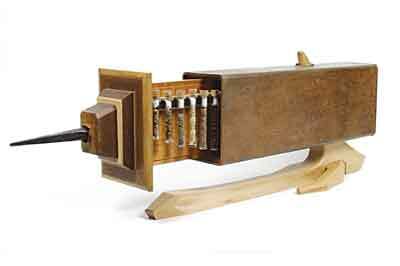 We were so impressed with the extent of Marco's skills that we've asked him to come back and share some of his working methods in a short series of articles, which will start next month; these will take us into the world of miniature woodworking tools and beyond. Please don't miss it; this sort of thing doesn't happen every day. It is hard to imagine what my work would be like without the early influence of Paul Hamler. Paul is a master tool maker, engineer, craftsman and all around inspiration. 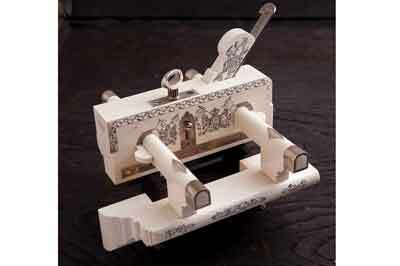 Paul specialises in making tools, both miniature and full size, as well as miniature firearms. 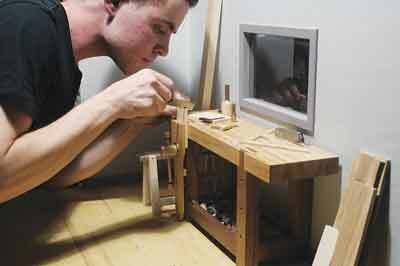 At the age of 14 I discovered his incredible miniature woodworking tools on the Internet. Not only were they miniature, they were also fully functional; crafted with the same materials and details as the full-size counterparts. They forever changed the way I viewed fine craftsmanship. His work shined a light on what is possible for me, if I devoted my life to the understanding and practice of working with different materials. Paul's range of knowledge from pattern making to metal casting, machining and engraving, made me quickly realise there is no limit. In the spring of 2014 I had the opportunity to meet and talk with Paul at the North American Model Engineering Expo. We showed each other our works in progress and talked about future project ideas. It was truly an enlightening experience. He passed on a ton of insight about his process of making and executing flawless details on a micro scale. Paul is a brilliant, humble man with a great sense of humour. Our time together will be cherished forever. His incredible work will continue to inspire young craftsmen and myself for generations to come. Photos of Paul Hamler and his work can be found here. He also has a blog of his more recent developments. Pick up the latest issue of Furniture and Cabinetmaking today!